Market Rasen twins Tom and Tim Neave (23) will both be contesting the 2019 National Superstock 1000 championship, but with different teams. 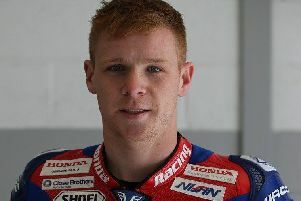 Tom Neave is to ride for Honda UK and will line up on the CB1000RR Fireblade SP2 to make a challenge for the title, while his sibling Tim will be on track with Morello Racing Kawasaki. Tom said: “I am chuffed to bits to have signed with Honda for 2019; it’s something I have always wanted and worked towards. “Honda is such a big name in racing and they are one of the teams you look up to. “After my accident at the last round I thought I’d blown my chance, but Harv (Havier Beltran - Honda Racing team manager) called, we got the deal done and I’m so thankful for this opportunity. Meanwhile Tim is to line up alongside Chrissy Rouse for Norwich-based Morello Racing Kawasaki. The team is looking to regain the Pirelli National Superstock 1000 Championship it won in 2015 and 2017 and will campaign the new Kawasaki ZX-10RR. Tim contested both the Dickies British Supersport Championship and Pirelli National Superstock 1000 Championship during 2018, with the Lincolnshire rider scoring consistently in both. Riding the 600cc NRC Yamaha, Neave rode to 11 top-10 finishes in the Supersport series and, despite only competing in eight of the 12 rounds, he finished 14th overall. He switched to the Superstock 1000 class in September, riding a GSXR1000 Suzuki and scored points in five of his six races, the highlights being eighth and ninth places at Oulton Park and Silverstone, respectively. Tim said: “I’m delighted to be joining Morello Racing Kawasaki and can’t wait to have my first test on the new Kawasaki ZX-10RR. “I felt I’d gone as far as I could in the 600cc class so switching to the 1000s for the last three rounds this year was done with 2019 in mind and to have everything confirmed already is perfect. He added: “As soon as Steve and I spoke, we were able to agree a deal really quickly and with a great team-mate in Chrissy, I’m looking to learn from him and improve as much as I can.